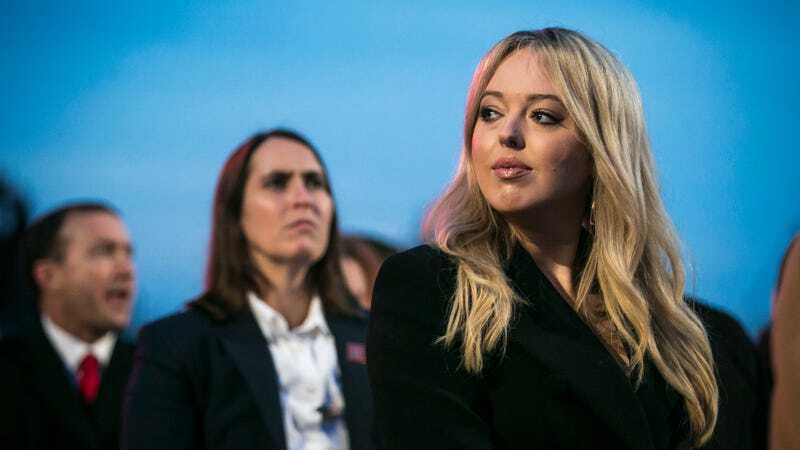 I had long fantasized Forgotten First Daughter Tiffany Trump would grow weary of playing Jan to Ivanka’s Marcia and, seeking revenge, blow up the whole operation, thus assisting the country in a robust and successful revolt. And though, over a year into Donald’s presidency, we have yet to anoint “Like A Bird” our new National Anthem, it appears the cracks are beginning to show, considering Tiff may have liked an Instagram photo that was critical of the GOP. It’s no King Richard vs. John, but the #RetweetResistance works in small ways, after all. Indeed, the Internet is full of sharp eyes, and on Saturday some social media sleuths noticed Tiffany Trump’s official Instagram handle had liked a collection of photos of signs from the New York City iteration of the March for Our Lives (as of 7 p.m. Sunday, the Tiffany Trump-bestowed heart was still there.) Included in the post was a photo sign reading, “Next massacre will be the GOP in the midterm elections.” WHAT DOES IT MEAN?! To be fair, it’s probably nothing. Just because Instagram lets you bundle multiple photos in one post, doesn’t mean people bother scrolling through more than the first couple of photos of your dog making a fellow dog friend at the dog park before making an absentminded double-tap. Julia Moshy, who posted the photo, is a member of New York’s infamous Snap Pack, the social media-savvy rich kids with whom Tiffany rolls, and Tiffany probably liked the photo because her friend took it. And since the anti-GOP poster was buried pretty deep in the post, it’s likely Tiffany, distracted by heartbreak and Torts midterms, didn’t see it in there. But still, America dares to dream. Help us, Tiffany Trump. You (and Robert Mueller, and Paul Manafort, and Stormy Daniels, and Hope Hicks, and Vanessa Trump, and phenylalanine) are our only hope.